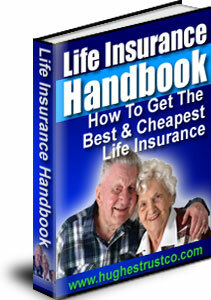 Canadian Term Insurance - EBook: Life Insurance Handbook - How to get the best and cheapest life insurance. U.S. Visitors please click here. Who Pay Too Much For Canadian Term Insurance? Think of 10 people you know. If they all have term life insurance, 9 of them are paying too much. Want to know why? You can see that the smart ones will get a quote and get the BEST for themselves and their families. The rest will take what they are offered and pay far more money EACH MONTH. "I would like to thank Mr. Hughes for providing great service. He found us the best price for our insurance needs. Orginally, I had doubts about working with an insurance company so far from us but Mr. Hughes has done a great job!" Did you see the big difference between the least and the most expensive? Buying expensive canadian term life insurance is like paying the first price quoted by a new car salesman. My name is Ivon T. Hughes and for the past 30 years I have been helping people just like you to choose the term life insurance policies that are the BEST and CHEAPEST for themselves and their families. As you care about your family and your finances, you need to get the CHEAPEST price on all your major purchases like term life insurance. TERM LIFE INSURANCE IN 30 SECONDS.
" For the past two years Mr. Ivon Hughes has provided me with outstanding service and counsel in helping to identify and obtain the appropriate type and amount of life insurance to suit my financial needs and family circumstances. His professional, courteous demeanor, and breadth of insurance knowledge has made him a pleasure to deal with. I commend him to you for your insurance requirements." How often do you get the chance to pay less for protection you need to have? You can save yourself serious money by comparing the prices from ALL the companies. After you have received your average price, you can then get the BEST and CHEAPEST premium on exactly the amount of coverage you want, along with our free Life Insurance Handbook. Don't know quite what you need? Your situation may be unique. With 30 years of experience, I can put it all together for you. Call me toll free at 1-877-842-3863 or email me at info@hughestrustco.com. Get an instant quote now. You shop for a car, don't you? Why not life insurance? PS: If you want to find out the advantages and disadvantages of Term Life, Whole Life and Universal Life insurance, download my free Life Insurance Handbook. It is a PDF e-book filled with valuable information and tips. Copyright 2011 The Hughes Trustco Group Ltd. Canadian Term Insurance. Canadian term life insurance quotes, whole life insurance, mortage life insurance, Canada and the U.S.